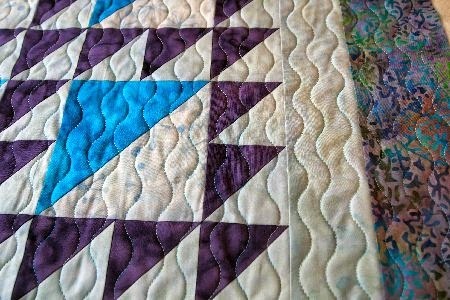 When Jacquie Gering visited the Front Range Modern Quilt Guild last summer, I fell in love with her "serpentine stitch" quilting. With my first attempt at this technique, I realized I would need a much larger surface to hold my project. So, I bought an "extra large" Sew Steady table. Plenty big, but I found the quilt tended to "stick" to the extension table. 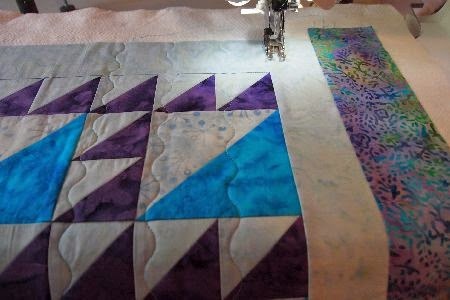 It's really hard to make even lines of quilting when the fabric hangs up on the sewing table! 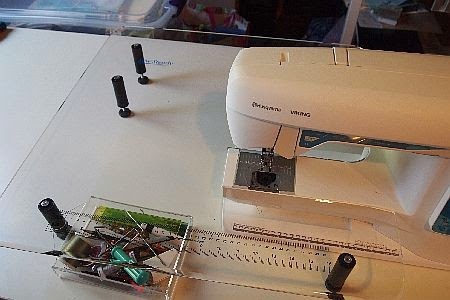 I had seen the Sew Steady Polish Kit on their web page, but the description didn't say anything about making the sew steady table more "slick." I thought it was to repair scratches on the table surface. I asked about the polish kit at Ruth's Stitchery and found out it costs less than $10. So I decided it was worth a try! The polish is applied much like shoe polish, with a small sponge. 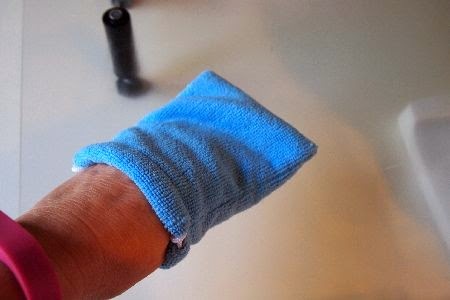 After it dries for 5 minutes, buff the table top with the provided cloth. Kind of reminds me of shining uniform brass. The table top is immediately more shiny and even feels more smooth. But will the fabric feed through more easily? Yes! I could feel the difference immediately. 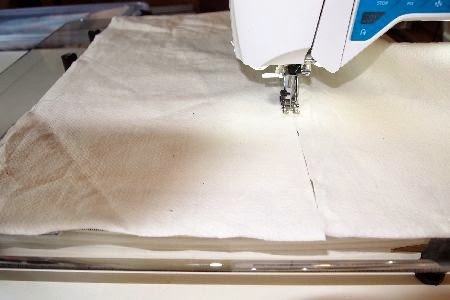 How about stitching two pieces of cotton batting together? Batting is notoriously "sticky." Yep! It even makes batting slide along the table surface like a greased pig! I made a mini "quilt sandwich" out of an odd block and tested the serpentine stitch quilting. Wow. Just. Wow. It really works! Totally worth the $10 -- if I'd known that was what this product is for, I would have bought it months ago! 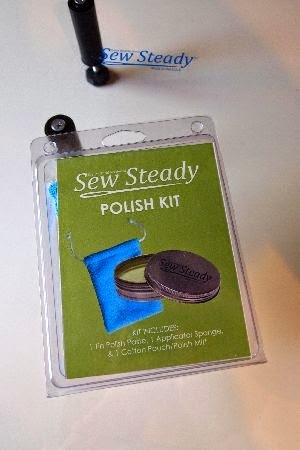 My only question is, "why doesn't Sew Steady advertise their polish kit for this purpose?" 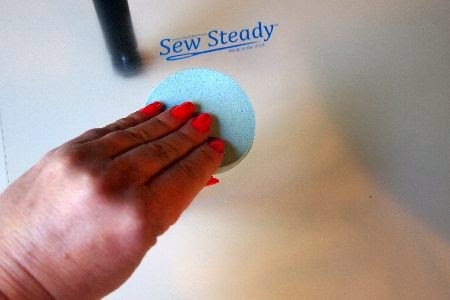 I imagine if you use your domestic machine for free-motion quilting, the Sew Steady polish would make moving your quilt around a lot easier, too. 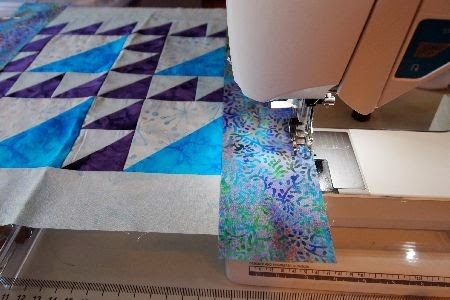 Now, if I'm going to have a finish for Friday, I'd better get back to piecing my Toes in the Sand quilt! Cool - I have never even heard of the stuff!!! But what about the quilt getting caught on the edges - did that still happen with a large quilt? This is why I don't use my extension table. Amy, I haven't tested it yet with a larger quilt. But I don't usually quilt anything larger than a baby quilt on the domestic machine, so I can't really speak to that. Sorry! Thanks for showing the serpentine quilting. It is a great idea. I'd never have thought of polishing the extension, but it seems logical. Thank you so much for the tip! I have a queen sized Supreme Slider, and it's just not big enough to make the difference I was looking for. You can also use spray silicone lubricant if you have some on hand. This makes the table nice and slippery.